Clinging to the side of the ship, Archie heaved violently as another rolling wave crashed against them, causing the ship to lurch and sway nauseatingly. The Gelert had never been a good traveller; his stomach wasn't built for a life at sea, he was afraid of heights - so flying, in any form, was out of the question, his balance had never been good enough to ride a bike and simply watching the high speeds of the faerie cloud racers made him dizzy. Walking was about the only form of travel that he could withstand, but as the worlds of Neopia were vast, with great distances and oceans between them, walking was not a practical way to travel. So it was that he once again found himself talked onto a boat by his cousin Saffy, who was determined to get them both to the Lost Desert to find out more about the last map piece that they had discovered in Geraptiku. After one last bout of nausea, the Gelert stumbled back to his seat, feeling a little green about the gills and completely regretting the Tigersquash sandwiches he'd eaten earlier that day. Saffy, who was half hidden by a giant map of the Lost Desert that she was holding in front of her, didn't spare a glance at him as he sat down. "Feel better?" she asked distractedly, not looking up from behind the map. Archie shook his head and groaned in response; his stomach flipped and gurgled as the ship swayed slightly again, causing the Gelert to clap his hand over his mouth in anticipation. Finally looking up from her map and noticing her cousin's pallid, clammy complexion, she folded her map neatly and stashed it away in her backpack. "Look, I've been trying to transcribe the writing on the back of the map," she told him, trying to distract him from his sea-sickness. "But it's in ancient Qasalan, and none of these hieroglyphs mean anything to me - they're not even in this dictionary I bought!" she added, gesturing frustratingly to the useless book on her lap. "So the first thing we'll need to do when we get there is find someone who can translate for us. My parents once mentioned a Yurble they met here, a long time ago. I think they said his name was Peregrine..."
"That doesn't sound like a Qasalan name," Archie interrupted, his voice muffled by the hand over his mouth. Saffy gave her cousin a brief, cool stare; the only inclination that she'd even heard him, before she continued her sentence, ignoring the pointless remark completely. "They said he was a scholar of some sort, seemed to know a lot about ancient artefacts and dead languages. Mum said he was very helpful in determining if the vase she'd bought in the bazaar was the real thing or not. It turned out to be counterfeit, and Mum went back with Peregrine in tow to argue with the seller. Got her money back and everything!" she added in a tone of slight awe. "You don't want to argue with my mum, believe you me!" she added, shuddering at the thought. "Anyway," she said, realising that she'd gone off track. "I'm sure he won't be too hard to find if we ask around in the bazaar - how many Peregrine's can there be in Qasala?" An hour or so later, the ship slowed to a stop, much to the relief of the queasy Gelert, who gratefully hopped from the dreaded mode of transport as soon as it had docked; hoping (unrealistically) that he would never have to set foot on one again. Left on the abandoned dock, Saffy took out her map again and after a few minutes hidden behind it with her eyes screwed up in concentration, she reappeared and pointed in a direction in which to start walking. The pair trudged aimlessly through the seemingly endless desert; their sandal-clad feet sinking into the sand, making their steps slow and sluggish; the blazing hot sun beating down upon them constantly; only stopping to refill their flasks with the cool water from the river and check the enormous map of Saffy's - not that it helped much as everything looked the same. There were no landmarks to point them in the right direction, other than the blurred images of the Pyramids in the far looming distance, and except for the gushing river beside them, there was nothing but sand all around them. It was no wonder that people started seeing things in the Desert. After what seemed like an eternity, and with the two Neopets almost ready to drop (Archie looked like a Zombie) something glinted in the distance. Saffy was the first to notice this and perked up right away. "Look, Archie!" she yelped, excitedly, pointing at the walled city that was materialising in the distance. With the last of their strength, the pair sped up (as much as they could whilst wading through sand) and soon enough they arrived outside the gates of Qasala. "Doesn't look like much," Archie commented, a little grumpily, turning from the crumbling walls of the city in front of them, towards the shining city of Sakhmet, whose gates gleamed brightly on the other side of the river. "Always so quick to judge," Saffy replied with a shake of her head. "Have you never heard the expression, don't judge a book by its cover?" she asked, waltzing through the open gates and into the bustling city behind them. The city inside, didn't appear to be a crumbling ruin like its outer walls, a fact that Saffy couldn't help pointing out to her cousin with a smug "hmph". The city had been almost completely restored to its former glory since the curse was lifted from it, although there were still a few grimy alleys with quick-fingered thieves lurking amongst them; ready to dash out at a moment's notice to relieve Neopians of their heavy purses. At the very centre of the city was a thriving bazaar, where various stalls in bright colours were set up to attract both tourists and locals alike. Vendors called out to the throng of people in the city, offering high discounts for their "one of a kind" items or haggled mercilessly with their customers, both determined to get the best price. Saffy and Archie, both a little overwhelmed by the sight, and feeling a touch lethargic after their long journey, moved about the bazaar listlessly, not sure who to speak to about finding Peregrine first. As they passed a stall selling weapons and battle armour, a brown Ruki sensing fresh prey, put on a winsome smile and called out to Saffy. "A pretty charm, for a pretty lady!" He held a battle charm in his outstretched hands, dangling it temptingly in front of them at an angle where the sun would show it off beautifully. "Deadly weapon for the battledome, missy! And I give you my best price at 75% off. A steal at 30,000 neopoints!" The Acara moved towards him and the seller, sensing a deal, grinned in delight. "Yes, yes, you'll never find a better deal than here my fine friend. What do you say? Have we got a deal?" "Hmm, it is pretty," Saffy remarked thoughtfully. "But actually, I'm looking for something else." "Of course," the Ruki nodded enthusiastically, pulling out all sorts of weapons from his stall to show her. "What are you looking for? A sword? An axe? This one of a kind Desert Spear? Very magical this spear. See the hieroglyphs, carved into the wood?" "A Yurble. Goes by the name of Peregrine. Do you happen to know where I can find him?" In that split second, the Ruki's winning smile and charming manner disappeared instantly. "Never heard of him," he answered coldly, his face hardening perceptibly. "And if you're not here to buy anything, then I suggest you clear off!" he barked, with a wave of his hand. "Fine, we'll go and ask someone else then!" Saffy responded, insulted at his rudeness, before storming off towards the next seller. The next seller wasn't any help either, nor was the one after that. In fact, none of the sellers seemed to want to help the Acara after hearing the name Peregrine. 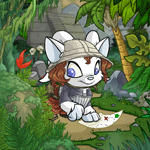 After asking around all day, with not one Neopet claiming to know the Yurble or where he could be found, Saffy sat down on a rock, clearly defeated. "Perhaps he doesn't live here anymore and that's why no-one knows him," Archie volunteered, sitting down next to his cousin. "Of course he still lives here, Archie! Those vendors were lying to us - they know him, all right." "But why would they lie to us?" "Isn't it obvious? Remember that story I told you about my parents? Peregrine knows what's real and what's counterfeit... clearly he's made some enemies amongst the traders over the years, which is bad news for us. How are we going to find him now?" "Did you hear something?" Saffy asked her cousin, looking around bewildered. Archie shrugged his shoulders, a puzzled expression on his face. He wasn't sure how Saffy could have heard anything amongst the hustle and bustle of the Bazaar; the merchants advertising their wares loudly to the city, the buzz of chatter from customers haggling with the vendors, or else gossiping about local news, children playing noisily in the street - it was enough to drown out thought. "There it was again!" Saffy exclaimed, though Archie still hadn't heard a thing. "It was a sort of hissing noise..." she trailed off, having caught sight of something. From the corner of her eye, she could just about glimpse a shadowy figure, half hidden behind a sandstone pillar. Catching Saffy's eye, the figure gestured furtively for her to follow, before it sneaked away, heading down a dark alley and out of sight. "Are you crazy?" Archie hissed, as the Acara took a step forward, as though to follow. "You have no idea who that was - or what they want and you're just going to blindly follow them? You don't know what's down that alley! They could be luring you into a trap for all you know!" he exclaimed frantically, his voice becoming a little shrill, the way it always did when he panicked. "Could be. But we'll never know if we don't try to find out!" she replied, indifferently. Archie spluttered wordlessly, trying to think of a way to change her mind, but before he could, she cut him off. "You don't have to come with me if you don't want to, but I'm going to see what this is about!" she said, stubbornly, before striding off to the shady looking alley. Archie looked around helplessly, his mouth opening and closing soundlessly, like a Koi out of water, whilst he debated on what he should do. He couldn't just let his cousin walk into a trap; he had to help her, even if that meant putting himself in danger too, so without another thought, Archie ran off after her - even though he knew he'd regret doing so later. The alley was pretty grimy, even for Qasala; dark, dank and smelly; littered with empty cans of Achyfi, and a couple of Zeenana peels, it was the last place that Archie wanted to be. Holding his nose as he walked past a particularly pongy pile of rubbish, he turned the corner to find himself face to face with a very creepy Transparent Hissi. Most of him was hidden in shadow by dark, heavy robes, with a loose hood that was pulled low over his hollow, black eyes. Archie could still, however, see the sheer translucency of his skin and the pale, spiky bones of his hands and tail beneath. Stumbling back in fright, he almost tripped on a Zeenana peel in his rush to back away from the terrifying creature. "I told you you didn't have to come with me, Archie," he heard his cousin's voice sigh exasperatedly, as she stepped out from behind the Hissi. Breathing a sigh of relief that his cousin was safe, he side-stepped warily around the shifty looking Hissi, to stand next to her. "So, what did you want?" the Acara asked the Hissi, boldly. The Hissi looked around cautiously, to make sure that he wouldn't be overheard, before answering. "I hear you're looking for Peregrine..." he hissed, his voice barely more audible than a whisper. "That's right," Saffy answered. "Do you know him?" "Indeed, I do. What do you want with him?" he asked, narrowing his eyes at them suspiciously and slithering a little nearer to the pair, causing Archie to take a step back in alarm. "What - " Archie squeaked, before clearing his throat gruffly and putting on a deeper, more fearsome (or so he hoped) voice. "I mean, what's it to you?" The Hissi gave an angry hiss and turned his icy gaze to Archie, who shrank back slightly, immediately sorry he'd said anything. "He knew my mother," Saffy spoke up, drawing the Hissi's attention away from her trembling cousin. "She said he was trustworthy, and we wanted to ask him to translate something for us." "Transssslate what?" he asked, his cold eyes now glittering with interest. "Just some ancient Qasalan scroll we found in my great aunt's house," Saffy lied, hastily. "Ancient ssscroll, you say? Well... I may be able to help you find him - for a price..." the Hissi replied, a sly smirk slowly creeping onto his eerily pale face. Saffy rolled her eyes; these Desert folk were all the same - they wouldn't help their own grandmother cross the road without the promise of a bag of Neopoints first. "How much?" Saffy asked, brusquely. The Hissi brought a bony finger up to his chin and pretended to think. "Five thousand!" Archie spluttered, outraged. "That's ridiculous!" The Hissi turned his skeletal face towards the Gelert and shrugged. "Well, if you'd rather sssspend the rest of your day asssking the localsss, go ahead..."
"Give us a moment," Saffy told the Hissi, pulling her cousin a short distance away. "You're not actually thinking about paying him are you? He's a crook, Saffy!" Archie hissed. "And we don't have that kind of money! We've barely got half that amount. We spent most of our money for those boat tickets!" "I know, Archie," she whispered back. "But how are we going to find Peregrine without him? No-one else in Qasala will give us the time of day. We'll have to pay him!" "If I may..." the Hissi, who had no doubt been listening in on their conversation, interrupted. "I'm more than happy to trade for the information... if you cannot pay me in pure, that issss." The two Neopets glanced at each other sceptically. "For inssstance, I sssee that you have a very fine medallion around your neck; gold, I presssume," he hissed, eyeing the talisman the pair had found in Geraptiku, greedily. "It is, yes," Saffy replied, untying it from around her neck and holding it out for the Hissi to take a closer look. "Yesss, thisss will do nicely," he remarked, as his bony fingers curled around the medallion tightly. "Now... the Neopointsss?" he asked, pocketing the golden talisman in his dark cloak. With one last look between the cousins, (Archie's of abhorrence; Saffy's of resignation) the Acara pursed her lips and rummaged around in her satchel until she finally brought out a small, brown bag that clinked and jangled when moved. "This is all we have," she told the Hissi, frowning. "I'm sssure it will be enough," he replied, practically snatching the bag of Neopoints out of her hand. "You will find Peregrine in the recently ressstored ssscrollery; the wordsss of antiquity. It'sss that bronzzze building; not far from the fountain. He ssshouldn't be too hard to find," the Hissi remarked, with a sly grin, before slinking off with his easily obtained money; his cloak melding with the shadows of the alley until he was obscured from view completely. For the adventurer in you!